Multitalented, lawyer and diplomat Nasser Ovissi also studied fine art in Rome. This work’s title—Persian Odalisque—refers to the painting’s subject; an “odalisque” is a female slave who served the sultan’s wives and concubines. This choice of subject suggests Ovissi’s familiarity with the popularity of the motif in European Orientalist painting, which includes many well-known examples. Some of the most famous are Jean-Auguste-Dominique Ingres’s Grande Odalisque (1814; Louvre, Paris) and later examples by Auguste Renoir and Henri Matisse. 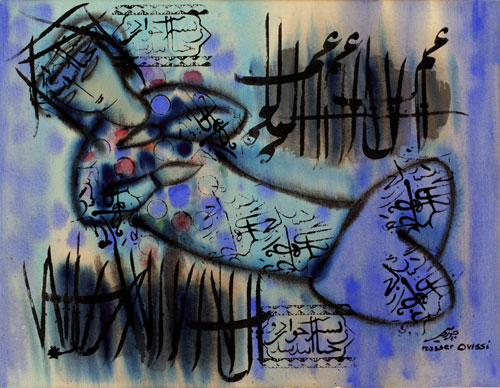 Inspired by paintings from the Qajar period (1785–1925), traditional calligraphy, and hand-painted cloth, Ovissi sought a return to artistic traditions of the past. His earlier works fused Persian visual culture with Cubism. Persian Odalisque makes use of similar source material but employs a more fluid visual language. Ovissi isolates one verse of poetry from its original context, turning it into calligraphic exercises that appear throughout the canvas. Dimensions 28 1/2 x 36 1/2 in.